Audio CD - Approximately 48 minutes of listening time. 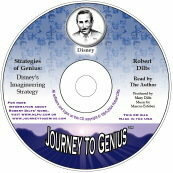 On this audio CD, Robert Dilts guides you through the powerful imagineering strategy. Imagineering (a synthesis of "imagination" and "engineering") is a term coined by Walt Disney and his animators to describe the process they used to form dreams and then turn them into realities. Weaving together quotations and anecdotes, Robert brings to life the creative process used by Disney and his team to drive their "fantasy factory." He then shows how the imagineering process may be used by the listener to enhance his or her own creativity and strategic planning abilities. Tracks 1-­6 explore the key elements of Disney's strategy for creating his classic animated films, amusement parks and live action features. At the core of this process is Disney's ability to access and balance his capabilities to think as dreamer, realist and critic. Each of these processes is clearly described and illustrated through specific examples and stories. Track 7 takes the listener through a guided meditation, applying the key phases of Disney's imagineering strategy to plans and ideas of his or her own. Robert instructs the listener in how to use the most appropriate cognitive and physical patterns to awaken and harmonize his or her own inner dreamer, realist and critic in order to transform dreams into goals and goals into actions. This stimulating and enlightening journey into the creative process of one of the world's most successful creative geniuses is one that you will enjoy over and over again.